The Rag Blog: Ted McLaughlin : Post-Racial America? Yeah, Right. Ted McLaughlin : Post-Racial America? Yeah, Right. Confederate massacre of black Union troops after the surrender at Fort Pillow, April 12, 1864 -- under the command by Confederate Lt. Gen. Nathan Bedford Forrest. Image from Wikimedia Commons. A couple of years ago some people were saying that America had entered its post-racial phase. The ides was that because the United States had elected an African-American as its president, surely we were beginning to get past the terrible racism that has plagued this country since its founding (when slaves were only considered 3/5 of a person). And that endemic racism has been very hard to get rid of. It took a Civil War costing the lives of many thousands of Americans to end slavery. But even after slavery was abolished and the Fourteenth Amendment was passed, racism did not go away. It just changed forms and assumed the guise of segregation, the KKK, and other forms of Jim Crow-ism. It then took another 100 years to outlaw those forms of racism. After the civil rights battles of the 1950s and 1960s, racism did not disappear but it did go underground: it was not quite as upfront and in-your-face as it had been in the past. Even in the South it was starting to be considered gauche to be overtly racist in public. The war against racism had not been won, but many battles were beginning to be won. Then we progressed enough to elect Barack Obama as president. But don't think this meant the country was post-racial -- far from it. If anything, having an African-American president seemed to give the racists permission to crawl back out from under the rocks where they had been hiding, and once again make their odious views public. Once again racism became a public menace -- a menace that could now be disguised as conservative politics (which must make conservative thinkers like William F. Buckley turn over in their graves). Politicians have been favoring the rich over everyone else since the Reagan administration, and this has resulted in a very unfair America -- and in George W. Bush's final term it culminated in the current recession. But those were white presidents, and while there was some complaining, poor, working class, and middle class whites generally went along with what was happening. But when Obama was elected that all changed. Now we had the teabaggers complaining loudly about socialism and big government takeovers -- even though the president and his policies were actually center-right on the political scale (and rather embarrassing to real progressives). Even the great socialist evil health care reform was only a slight reform and, in fact, a strengthening of the prevailing capitalist system -- and most of the reforms had been proposed by Republicans in the past. Obama's great sin is not in being a socialist or even a liberal -- he's neither. It is the color of his skin. The teabaggers just can't stand having an African-American president (just look at their signs when they rally) and their political views are a thinly-veiled excuse for their racism. The "birthers" are even more obvious about their racism. They never worried about a birth certificate when whites were president (or even when McCain ran for president, and he was actually born in a foreign country). Greg Stewart of the Mississippi chapter of the Sons of Confederate Veterans displays mississippi license plate commemorating the 150th anniversary of the Civil War. They're considering another to honor Confederate general and KKK pioneer Lt. Gen. Nathan Bedford Forrest. Photo by Solis / AP. And its worse than just the teabaggers or the birthers. The KKK and white-only militias are seeing growth once again, after a couple of decades of declining membership. And even some state leaders are again starting to celebrate white privilege. Some states are celebrating the 150 anniversary of the formation of the Confederacy (an act of treachery by 13 Southern states). 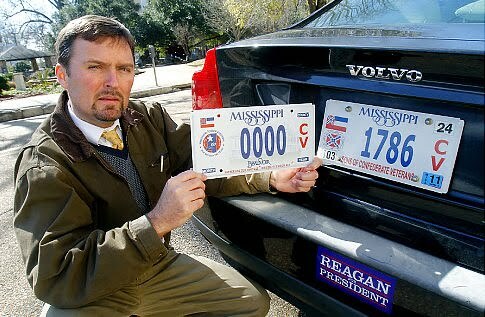 And in Mississippi, the state is considering a license plate that would honor the racist hero Nathan Bedford Forrest. I'm sure those wanting to honor the Confederate general with a license plate will say it is just a celebration of "Southern heritage." That's nonsense. It's nothing less than a celebration of racism. And a cursory glance at the life of Forrest will confirm that. 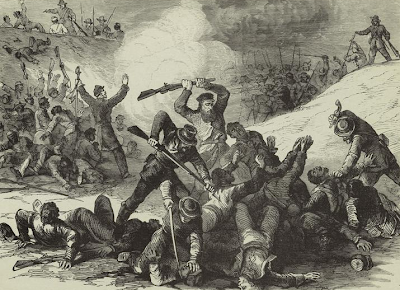 During the Civil War, at Fort Pillow, he massacred hundreds of African-American troops -- after they had thrown down their weapons and surrendered! After the war, he was very active in the KKK. Although he did not found the organization, he did centralize the disparate KKK groups under one banner and gave them a recognizable leader after being chosen Grand Wizard. Honoring Nathan Bedford Forrest isn't a celebration of Southern heritage -- it's a slap in the face not only to minorities, but to all decent Americans. And it's just one more example of racism in America. The election of Barack Obama to be president did not mean America was post-racial. It just showed how racist the country still is. We still have a long way to go before we live up to the dream of equality written in our Constitution.